Situated in the centre of Dubai’s busiest trade area, Nasser Square, the Al Maydan Shopping Centre is a unique urban retail center that offers a complete shopping spree for the real shoppers. This magnificent mall exhibits a Gothic look with Omani-style architecture and traditional Arabic decor that can allure any visitor to stop and take a pic. Like other malls, it is a complete shopping destination with its variety of retail outlets in clothing, cosmetics, apparels, bags, carpets and electronics. It is marked by its Omani style of architecture and Arabic interiors. Al Maydan has more local brands. It has a vast choice of fur, leather, shoes, clothes, handbags, jewelry, cosmetics, lingerie, carpets, electronics and mobile phones. Added to these, it also has a beauty salon. There are dozens of carpet sellers here offering cheap carpets to royal-worthy rugs. You can find a huge variety of contemporary, modern, traditional and custom made carpets at discount prices. 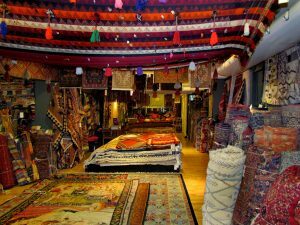 Also, you’ll find every type of rug imaginable, from customary Indian dhurries and oriental hand-knotted rugs to luxurious silk rugs and Burza rugs of all sizes and prices. If you’re looking to buy a fur or leather coat in Dubai, head on to Al Maydan Shopping Center. It offers a wide range of fur, leather and winter outerwear collections. Established manufacturers and wholesalers offer incredible deals in all kinds of fur, from rabbit to Barguzin sable. Baniyas Square Metro Station is the nearest metro station. It is on the Green Line. The RTA operates various buses that travel on Al Nahda Rd. It is located 5 minutes distant from the airport. All taxis go to Nasser Square, Deira. You need to be on Al Nahda Road. Al Maydan Shopping Center lies next to the Emirates International Hospital. Al Maydan Shopping Center Location – It is located opposite Nasser Square beside Emirates International Hospital in Deira. The mall is on Al Nahda Rd, five minutes away from the airport.